Heat the olive oil (two turns of the pan) over medium-high heat in large skillet; add the bacon and crisp. Remove to a plate; add the onion to the drippings and reduce the heat a bit. Cook to soften, then add the garlic, corn and thyme; cook until the corn just begins to lightly brown. Add the stock, bring to a bubble and reduce a minute or so. Stir in the mascarpone cheese and reduce the heat to low. Salt the boiling water and cook the pasta to al dente. Add a ladle of the starchy cooking water to the sauce, drain the pasta and add it to the pan. Toss vigorously with the corn sauce, bacon and a handful of cheese to combine and serve in shallow bowls with parsley and chives on top; pass extra cheese at the table. In Recipes-list.com we have selected the most viewed recipes from category - uncategorized . Enjoy the best recipes specially selected for you! 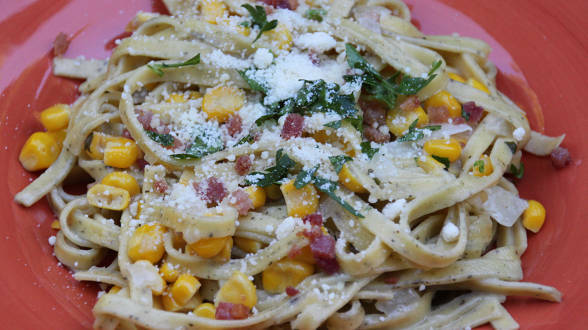 Bacon, Corn and Mascarpone Tagliatelle is the right choice that will satisfy all your claims.